Cleans and protects your car in one easy step! Griot’s Garage Best of Show Wash & Wax will take your weekly car washes to the next level! Griot’s Garage Best of Show Wash & Wax contains powerful cleaner agents that will be able to remove tough build-ups of dirt, road film, sap, and other hazards from your paint surface. The ultra-thick formula in Griot’s Garage Best of Show Wash & Wax will ensure that you always get a very abundant amount of foam and lather when washing your car, increasing the quality of clean and the safety for your paint. Probably the most important aspect of Griot’s Garage Best of Show Wash & Wax is the carnauba wax that it contains. The carnauba wax will adhere to your paint surface while you wash your car, leaving behind a durable layer of protection and a deep, warm gloss. Taking care of your vehicle can take quite a bit of time to ensure that it is done properly. Combining steps of the detailing process into one product has been an aim for many detailing supply companies. By using products that can tackle two or more aspects of detailing in one, you drastically cut down the time it takes for you to fully detail your vehicle. Griot’s Garage Best of Show Wash & Wax is one of these time saving products. Griot’s Garage Best of Show Wash & Wax allows you to properly clean your vehicle and apply a protective, glossy layer of carnauba to your finish in the process. By washing your car weekly using Griot’s Garage Best of Show Wash & Wax, you can extend the lifespan of the wax you already have on your paint, allowing you to save time and money by delaying the frequency of your major waxing jobs. 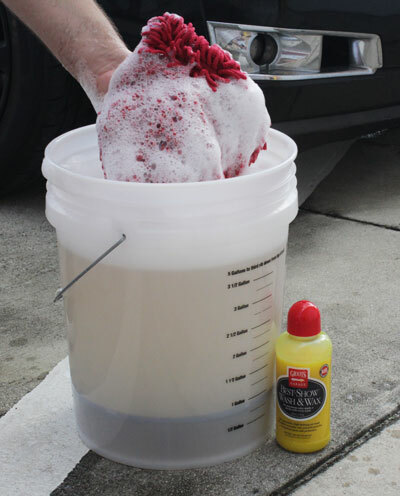 The cleaner agents contained in Griot’s Garage Best of Show Wash & Wax were specifically formulated to be able to tackle even the toughest cleaning jobs. These cleaner agents will be able to easily break the bond between your paint and any number commonly encountered environmental hazards. Once the bond is broken from your paint, you will easily be able to wipe them from your paint’s surface using your preferred wash mitt, wash brush, or wash sponge. The thick formula of Griot’s Garage Best of Show Wash & Wax will always ensure a thick layer of foam during your wash. Not only will this thick foam aid in the proper distribution of the product to ensure it is being used as effectively as possible, but it will also increase the safety for your car’s paint by providing more of a buffer between your sponge and your paint, reducing the risk of washing scratches during your car washing routine. This product lives a nice shine but, also lives water spots if, used in partial sun and not dried quickly.